The MWIS weather forecasts for Sunday past all looked superb. 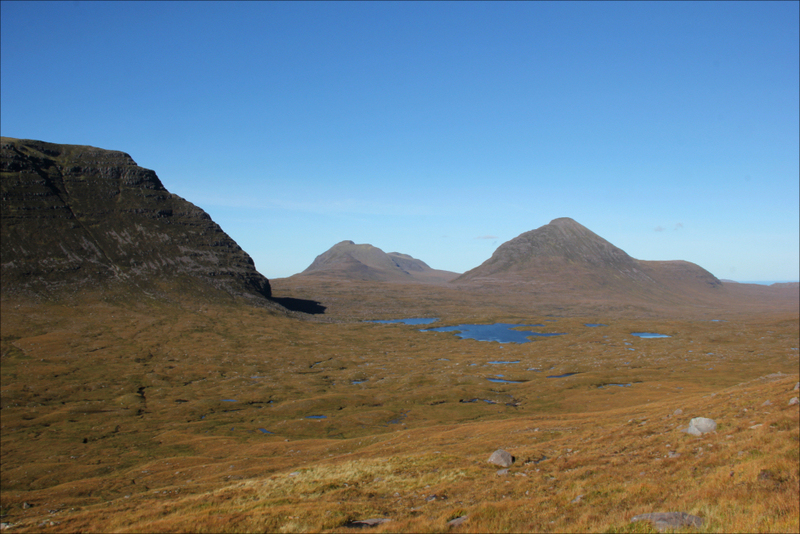 On a great day it is worth doing a great hill, I therefore decided to head for the North-West Highlands as the majority of great Scottish hills are to be found there. 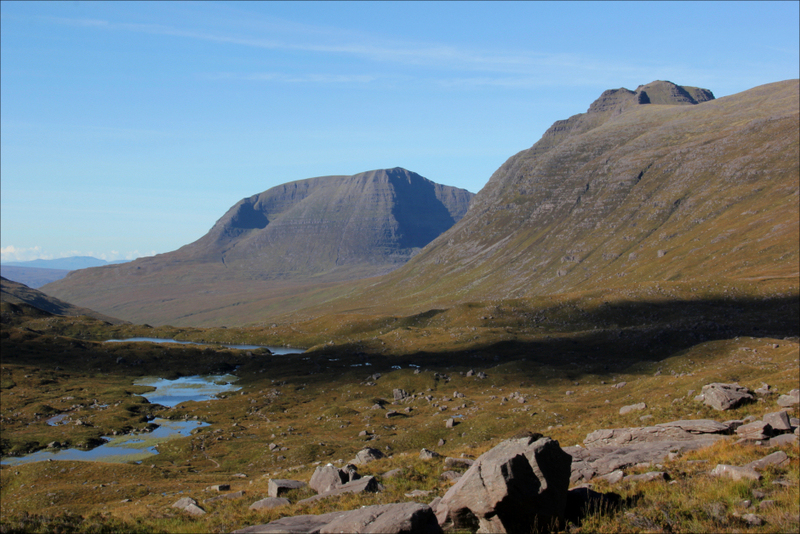 On reaching Inverness, I opted to head to Torridon for an ascent of either Liathach or Beinn Eighe. 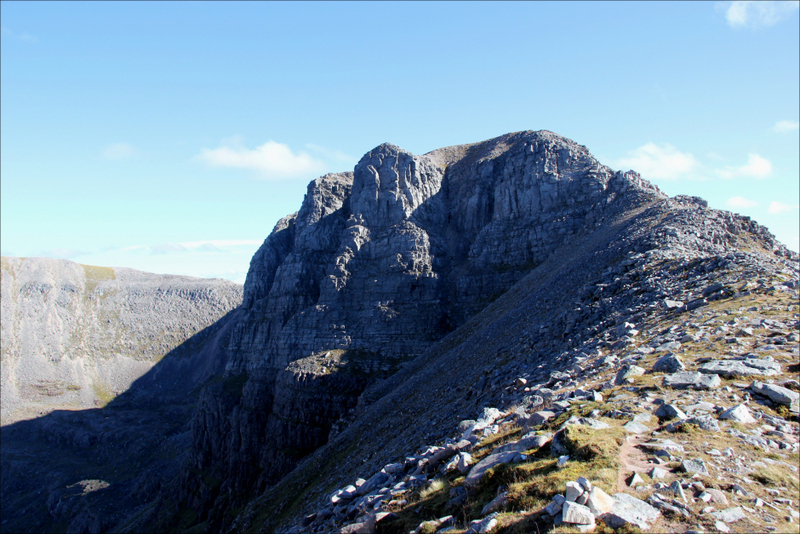 On reaching Kinlochewe, I chose Beinn Eighe as what could be better than visiting Coire Mhic Fhearchair on a perfect day! 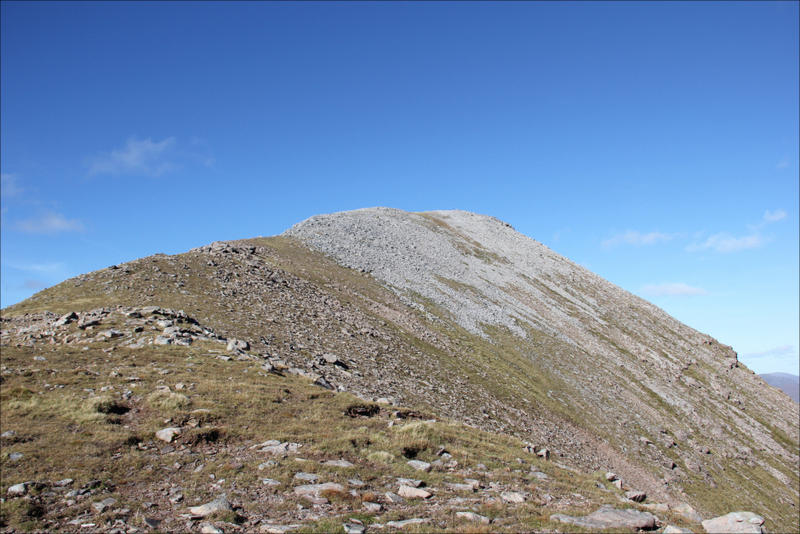 Had I left earlier in the morning, I would have been keen to undertake a full traverse of Beinn Eighe. 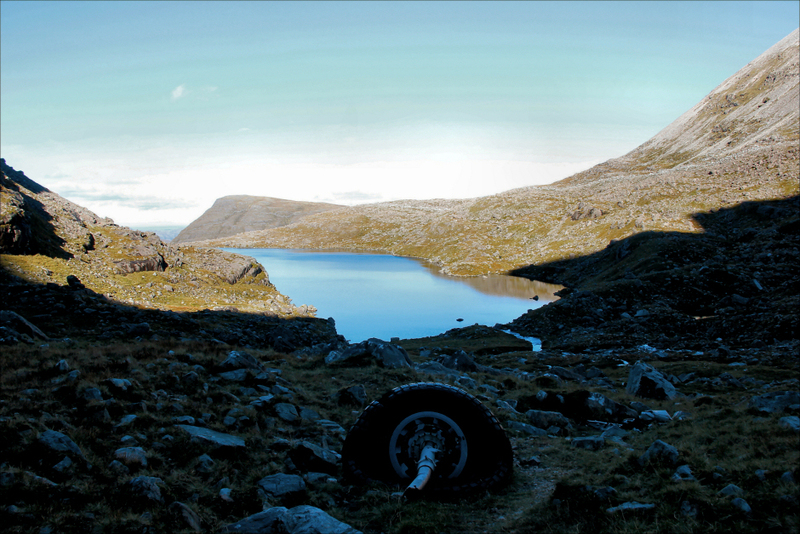 However, as it was already past 10:30 on arriving at the Beinn Eighe car park, I opted for a shorter day to i) visit Loch Coire Mhic Fhearchair, ii) go looking for plane wreckage from the 1951 Lancaster crash and iii) get up onto the ridge to ascend the Munro Top, Sail Mhor. 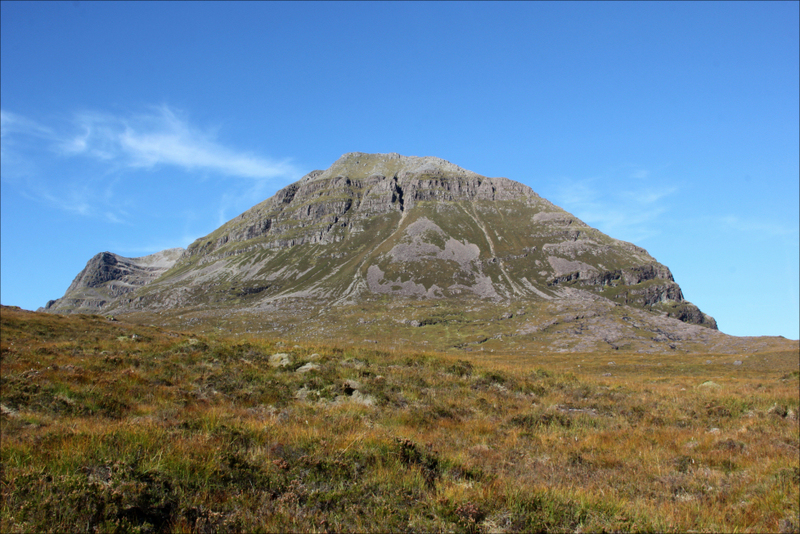 From the Beinn Eighe car park, I set off along the track between Liathach and Beinn Eighe which leads round to Coire Mhic Fhearchair. I last walked this track in 2012. The weather was as outstanding as forecast, possibly better. 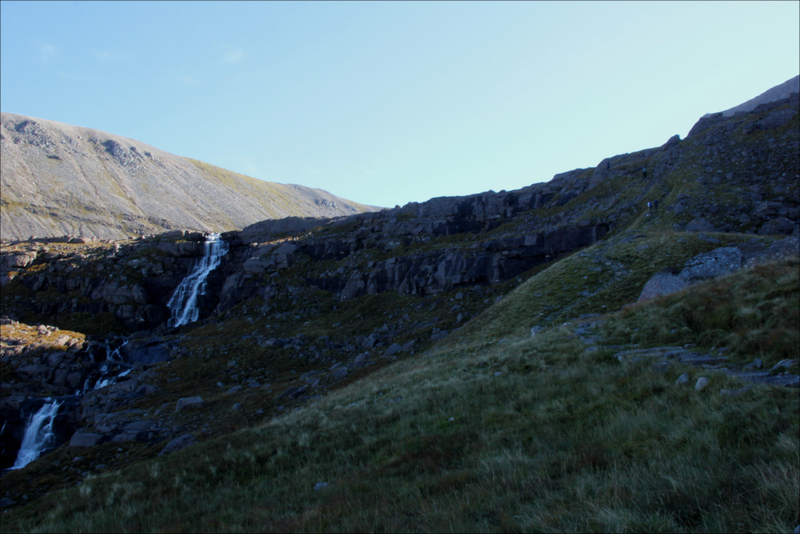 Due to my late start, I didn't meet anyone on the track until reaching the waterfalls just below Coire Mhic Fhearchair. Great to have this wonderful trail to myself. 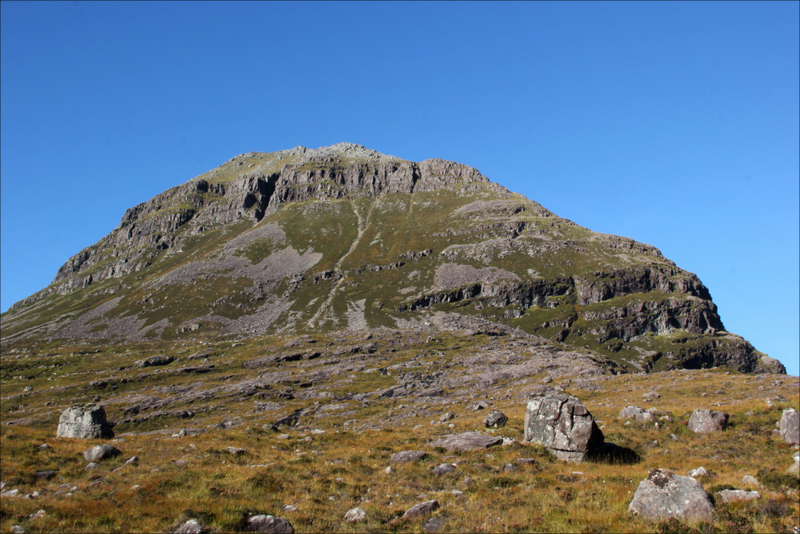 As I walked past Liathach, I decided that I need to revisit this hill again soon as I have only ascended it once previously. I have also not as yet ascended its Northern Pinnacles to get to what is arguably the hardest Munro Top on the Scottish mainland. As I progressed along the track, I stopped several times to take photographs. 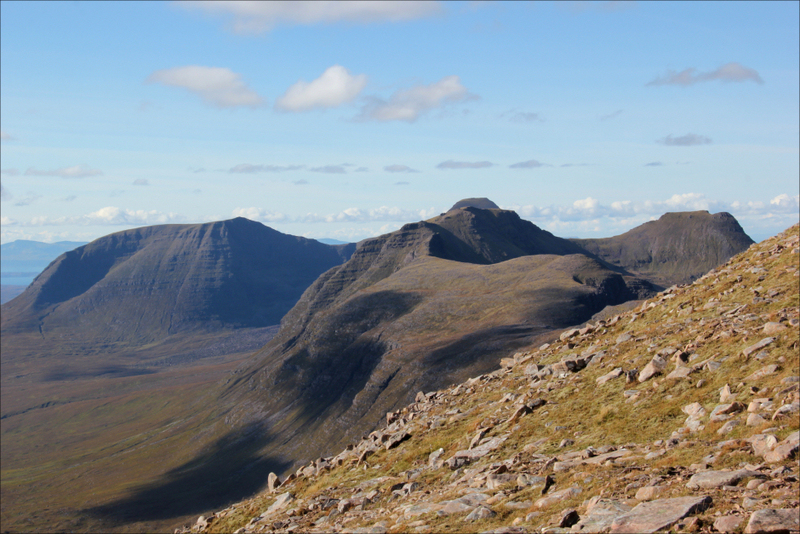 Every hill in the Torridon area is great. 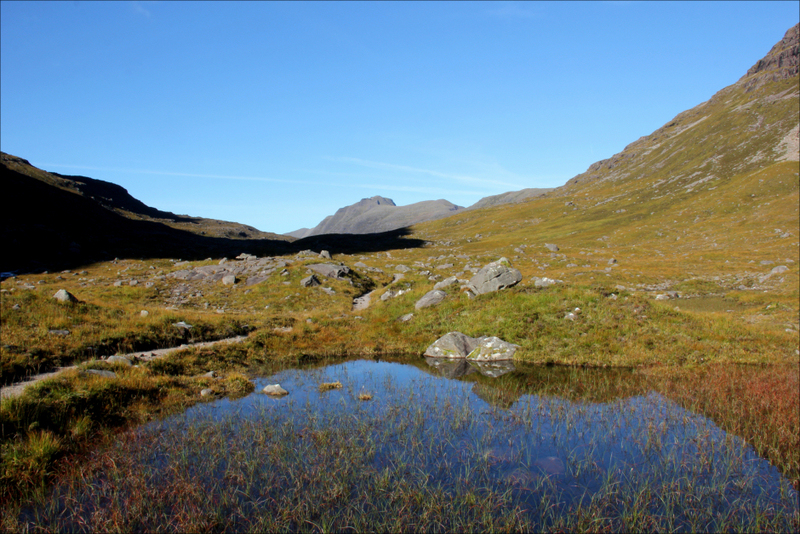 Beinn Dearg falls just short of being a Munro but it is every bit as good as Beinn Alligin, Liathach and Beinn Eighe. 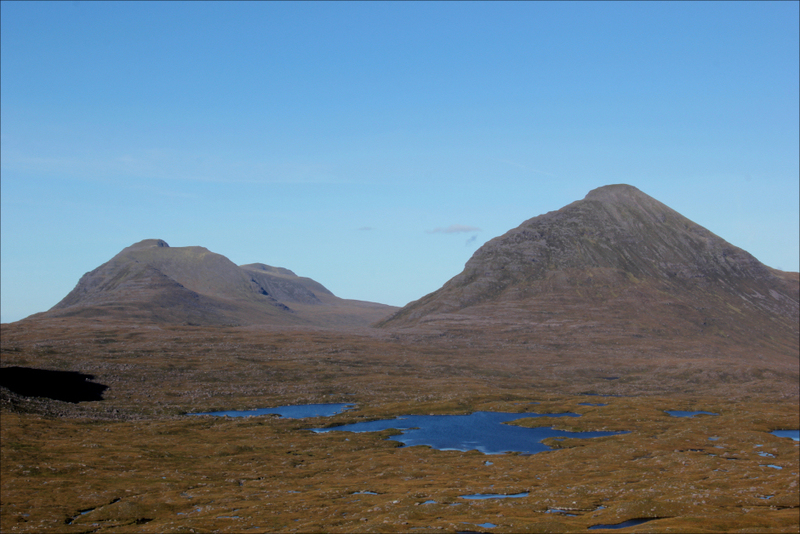 Baosbheinn and Beinn an Eoin are equally superb as is the Graham, Beinn a' Chearchaill. 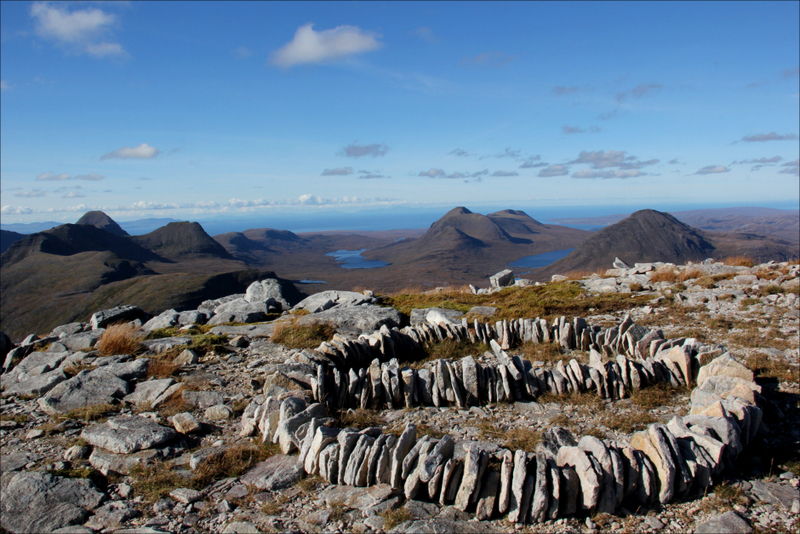 How could you not love Torridon! 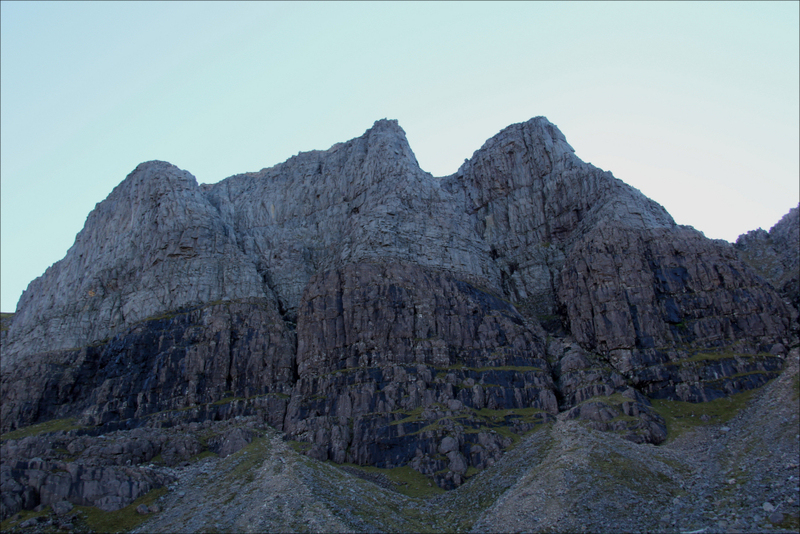 On seeing the Northern Pinnacles of Liathach and zooming into them from a distance, I have to admit they look a bit "interesting". I think I might want to do these in company or at least thoroughly research the route beforehand. As I walked along the track, I spotted a few dragonflies but little else in the way of wildlife. I could however hear the almost constant sound of stags rutting. What a great sound to hear on such a great day. 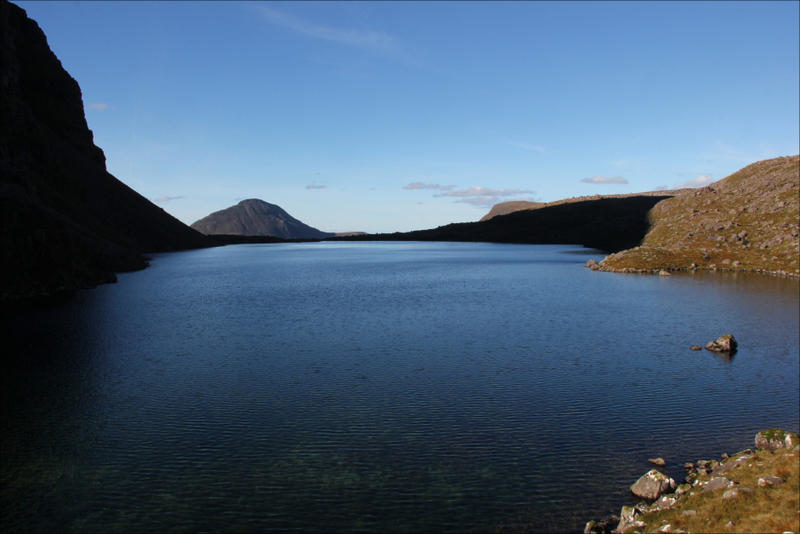 The walk round to Loch Coire Mhic Fhearchair was longer than I remembered taking almost a full two hours to get there. I was going to arrive at the loch in perfect time for lunch. 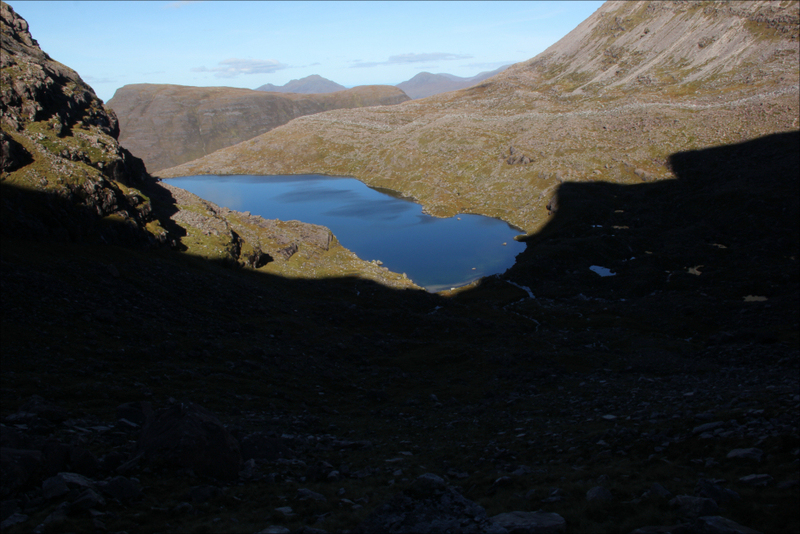 With the sun shining brightly overhead, I was unable to get any really good photos of Loch Coire Mhic Fhearchair as it was too bright and I was getting too much lens flare. 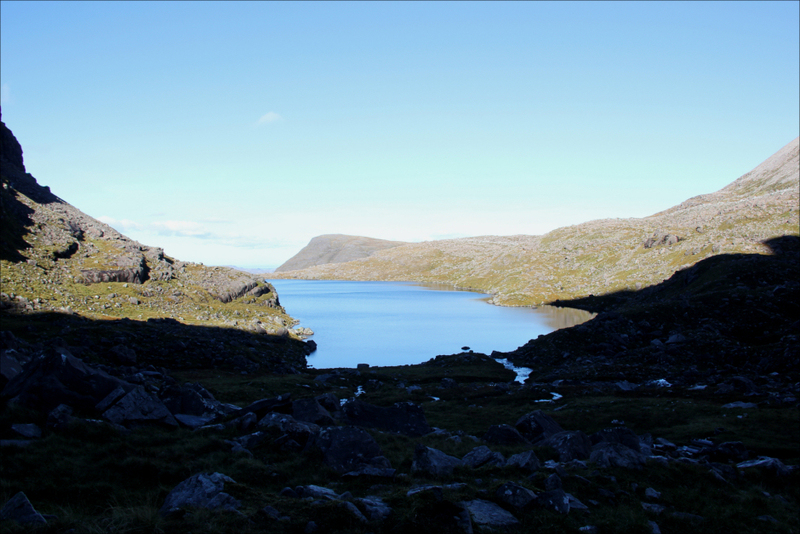 However, by the time I walked round to the far side of the loch, I was able to take some photos with the sun behind me while standing in the shadow of the coire. 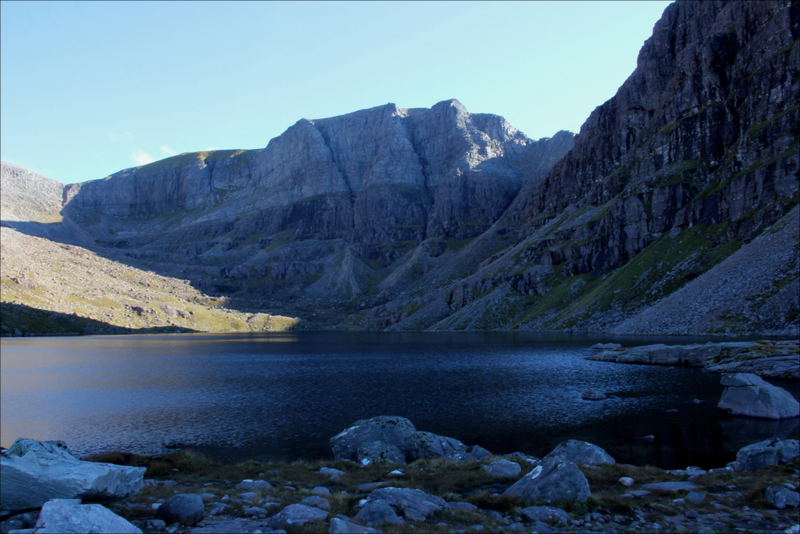 As well as the wonderful loch, the finest feature of this coire is the rocky triple buttress. 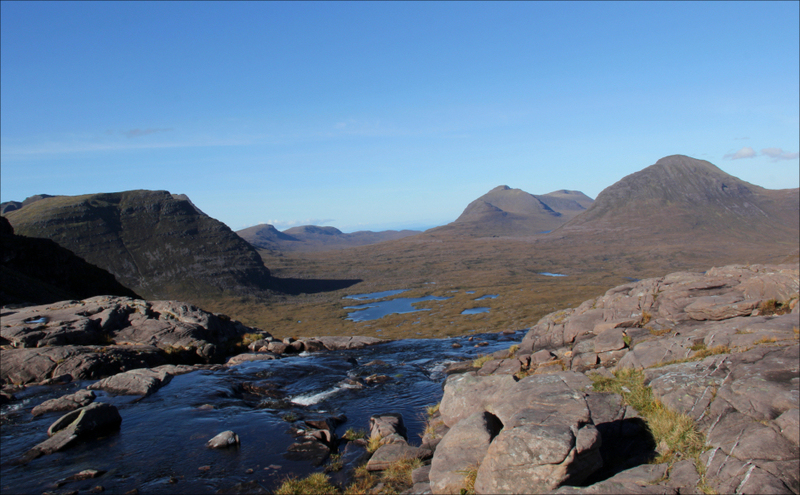 The triple buttress is made of red Torridonian sandstone topped with grey Cambrian quartzite. 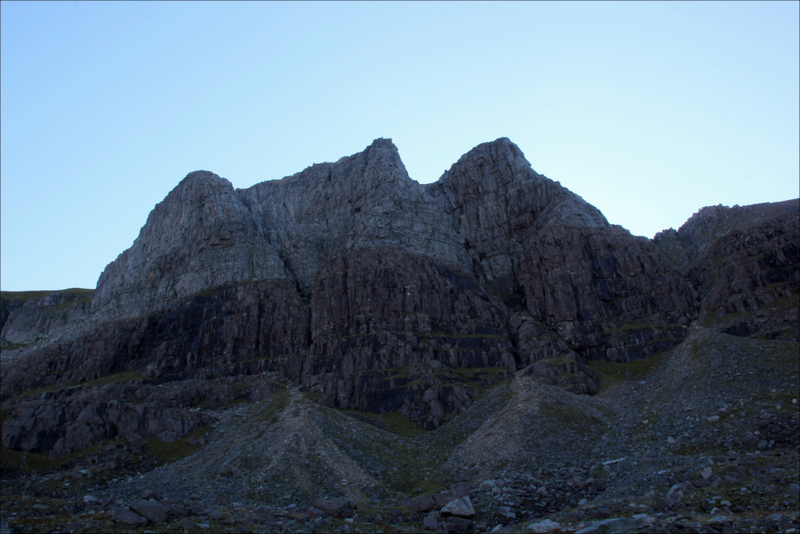 Some winter, in the not too distant future, I would love to climb Fuselage Gully, a Winter grade II route up the side of the triple buttress. The crux of this route is getting past a propeller from the Lancaster crash which is stuck into the rock like a kind of Excalibur. 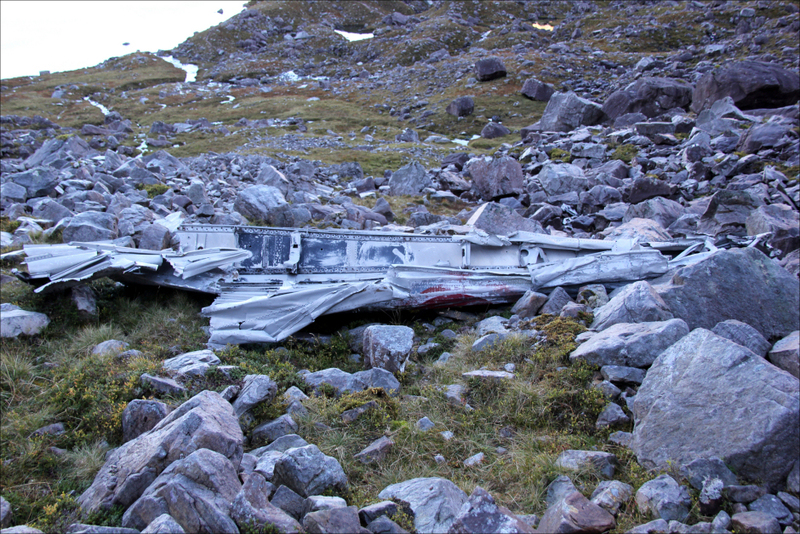 It didn't take long to start finding wreckage from the plane crash. 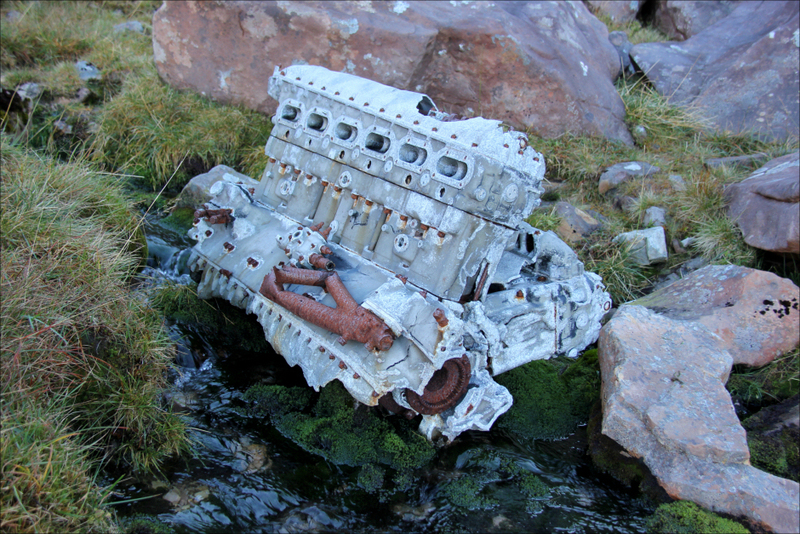 I located a couple of engines, a wheel, various parts of the aircraft body and dozens of small fragments. Had I undertaken a wider search I would likely have found much more. I made my way up towards the base of Fuselage Gully before cutting across to find an easier way up onto the ridge. During my ascent I come across a narrow path, of sorts, which I followed for the final section of ascent. I would later follow this path for its entire length in descent. 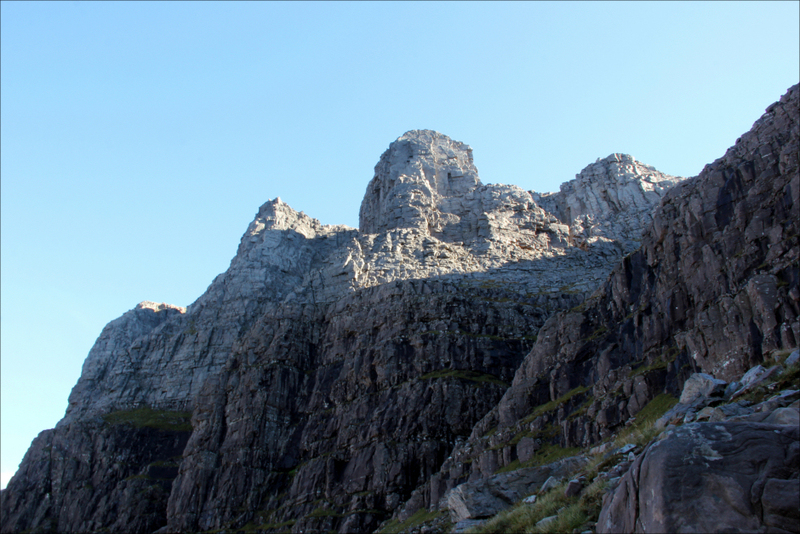 It was nice to see the triple buttress from different angles during the ascent. 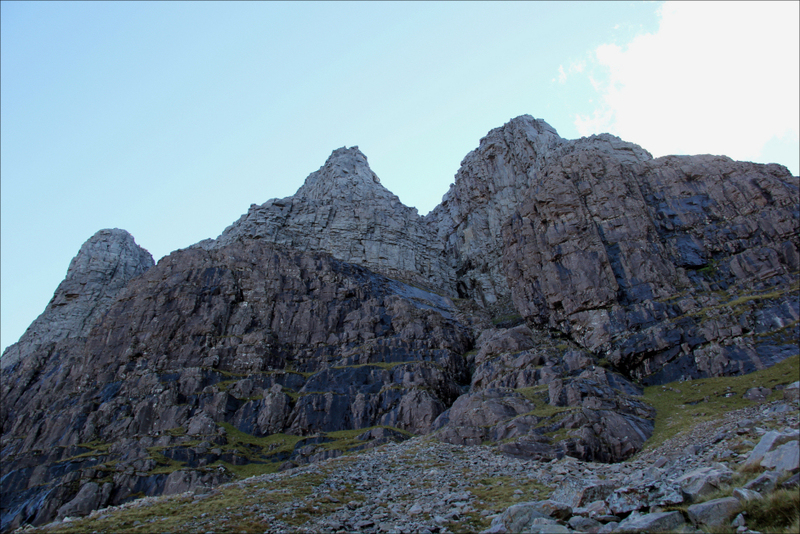 This ascent route is much more interesting than the eroded, steep standard tourist route up towards Ruadh-Stac Mor. Care is however required as the gradient is steep. 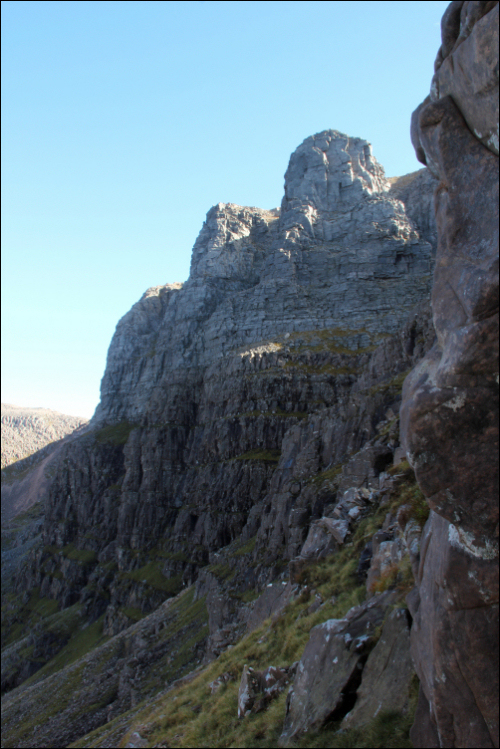 Despite enjoying the ascent of the coire, it was a bit of a relief to get up onto the ridge. From here the ascent to Sail Mhor was very straightforward. 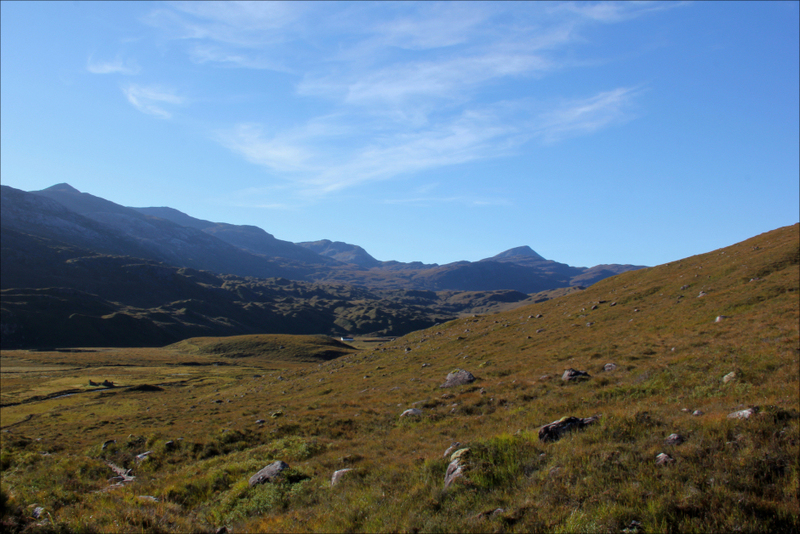 This ascent route avoids the section of scrambling which lies between Coinneach Mhor and Sail Mhor. 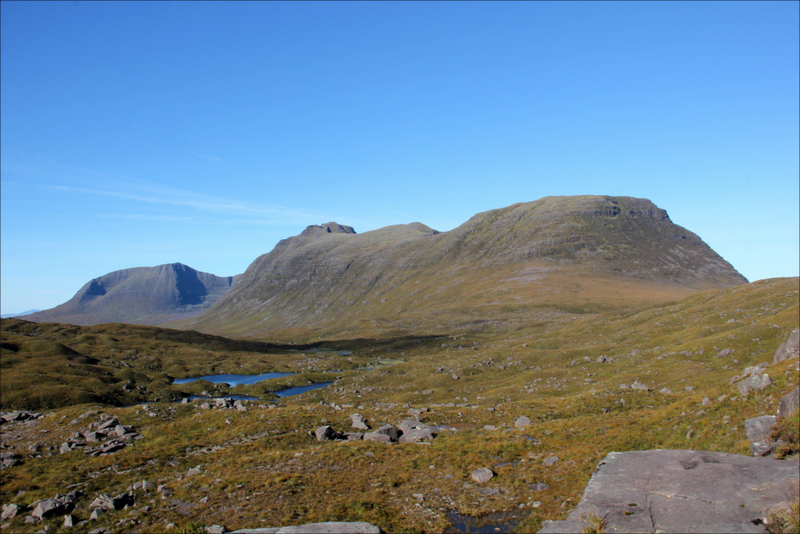 During the ascent of Sail Mhor, I stopped briefly to chat with another walker who was on his way down from Sail Mhor. On heading up towards the summit, I passed an example of "rock art". Someone has been going around creating such works of "art" on a number of North-West Highland hills. Some of the ones found on other hills are far more intrusive than this one but even so I don't think there is a place for an individual's own "art" on the hills. What if we were all to start doing this? Our hills will end up in a real mess. I think these should be deconstructed or better still not built in the first place. Taking the "art" out of the picture, the view behind the "art" was fabulous. 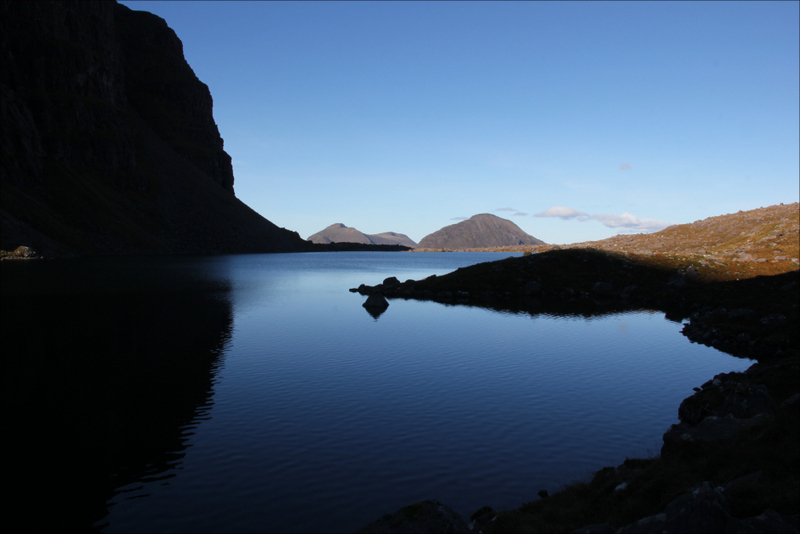 Torridon at its best. 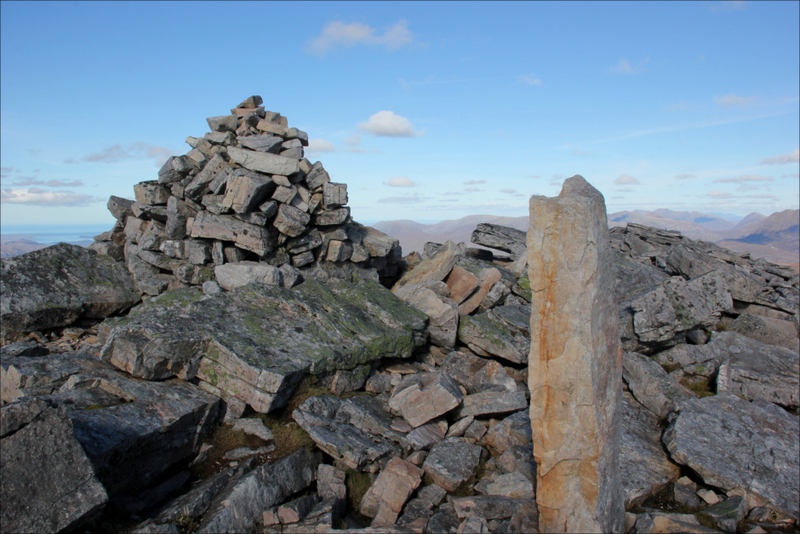 On reaching the summit cairn of Sail Mhor, I wasn't sure if it was the high-point or if the high-point was a bit further along the ridge. I therefore proceeded further along the ridge to ensure I did visit the true summit. On reaching the point further along the ridge and looking back, the cairn does appear to be the high-point. 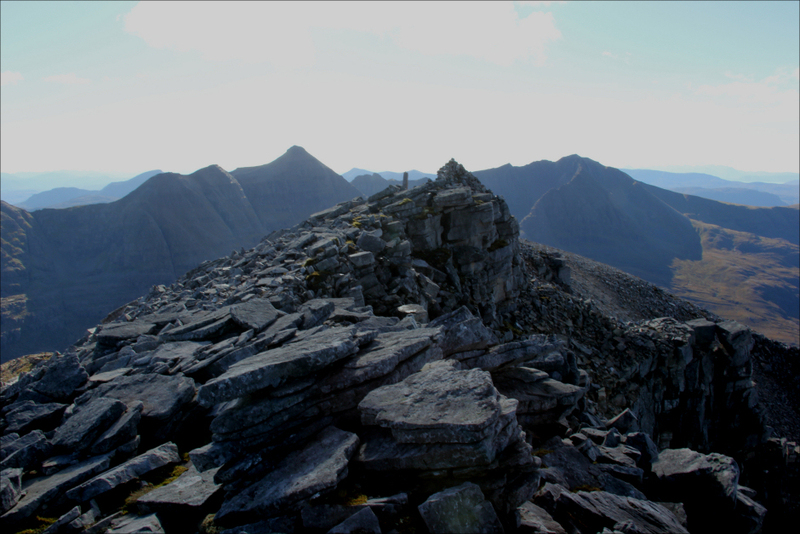 From the summit of Sail Mhor, it would have been great to continue along the ridge right out to the Black Carls however time was not on my side. 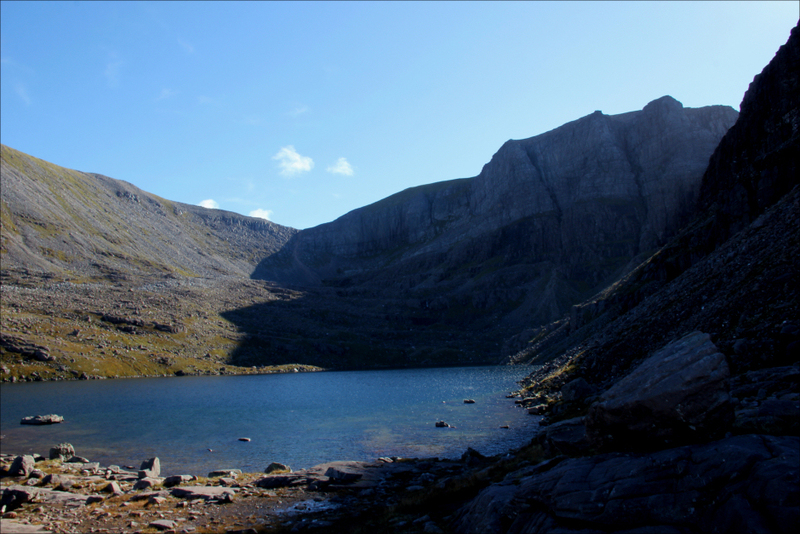 I therefore decided to return via my route of ascent which would allow me to once again visit the lovely Loch Coire Mhic Fhearchair. On reaching the loch, I was passed by three others coming down the tourist route approach. They were going at such a speed I could not keep up with them and I am normally fairly fast. There was however no hurry on such a fine day. 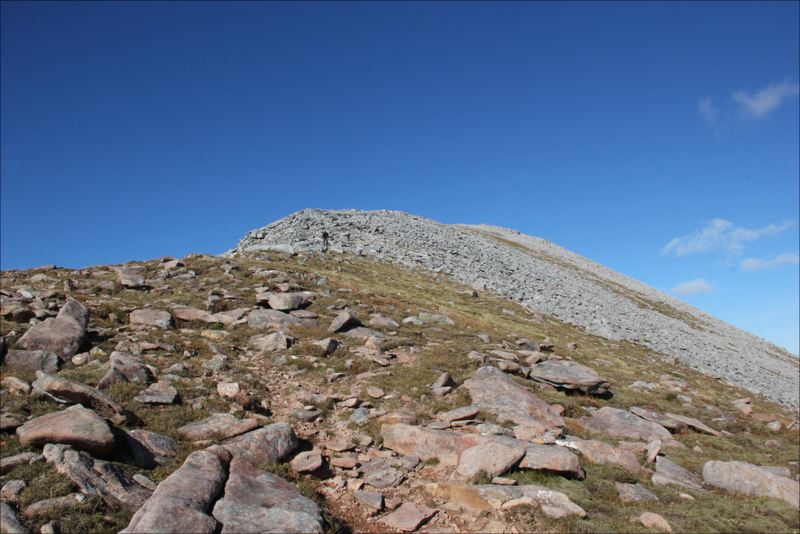 I am already looking forward to doing Beinn Eighe again. 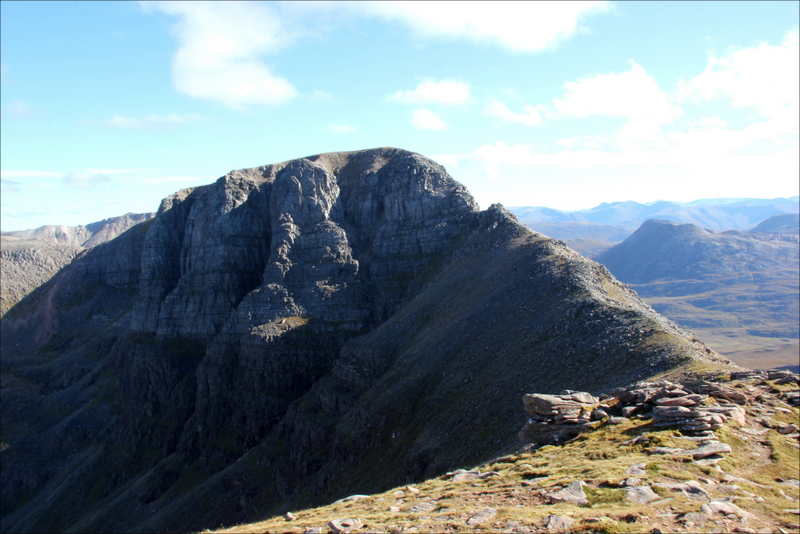 It is definitely in my top ten Mountains of Scotland. It would be great if every hill day was like this .